Women's Health Matters - What’s the difference between “baby blues” and postpartum depression? 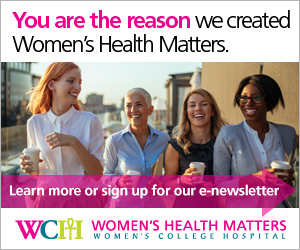 Women’s Health Matters spoke to Dr. Cindy-Lee Dennis, senior scientist at the Women’s College Research Institute and Shirley Brown Chair in Women’s Mental Health Research at Women’s College Hospital, about the difference between baby blues and postpartum depression. Women with baby blues may find themselves feeling weepy, sad, anxious, irritable or impatient. They may experience mood swings and fatigue. They may cry for no reason. While many of these symptoms are shared with depression, baby blues are different from postpartum depression. Baby blues may affect up to 80 per cent of mothers. Postpartum depression is less common, but more serious. A key difference is that symptoms of postpartum depression continue, while baby blues usually go away within a few days to a couple of weeks. “Postpartum depression is a depressive episode that occurs within the first year postpartum, but for the majority of mothers it will develop within the first 12 weeks,” Dr. Dennis says, adding that postpartum depression affects about 13 per cent of mothers. Although baby blues and postpartum depression are different conditions, one can be a risk factor the other. A meta-analysis (a systematic review of existing research) involving 84 studies suggests that significant baby blues that don’t resolve is a risk factor for developing postpartum depression. It’s important to treat postpartum depression not only for the mother’s health, but also because it can have a negative effect on her relationship with her baby, and on the baby’s behavioural, social and cognitive development. It can also affect her partner and their relationship. When a new mother is depressed, it increases the risk that her partner will also develop depression.